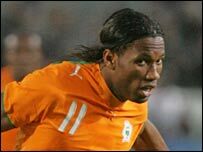 Didier Drogba scored two first-half goals to help the Ivory Coast beat Slovenia on Sunday in Evry, France. The Chelsea marksman scored in the 35th and 36th minutes, with Kanga Akale hitting the third on 70 minutes. It was the Elephants first win in three games, after 1-1 draws against Switzerland and Chile. Drogba, who has scored 23 goals in 34 international matches, will lead the Ivory Coast's attack at the World Cup finals in Germany. The West Africans, who make their debut at the tournament, face the Netherlands, Argentina and Serbia-Montenegro in Group C.